TORONTO--(BUSINESS WIRE)--Following lackluster returns in the Canadian stock market in 2017, financial advisors are concerned that higher levels of market volatility, interest rate hikes, and possible asset bubbles threaten investment returns for 2018. This environment can also lead investors to make costly mistakes – and managing the emotional reactions of clients could be advisors’ greatest challenge in 2018. Those are some of the most important findings of a survey released by Natixis Investment Managers. The company’s Center for Investor Insight surveyed 150 Canadian financial and investment advisors about their market challenges and how they are positioning client portfolios. According to the findings, 94% of respondents said that preventing clients from making investment decisions based on their feelings is important to their success. In addition, 34% of advisors reported that their clients reacted emotionally to recent market movements, and just 43% believe investors are prepared for a market downturn. Threats to investment performance: Advisors see rising volatility as the biggest potential threat to the markets. Seventy-three percent say it would negatively affect overall investment performance; trailing as perils are asset bubbles (63%), geopolitical events (57%) unwinding of quantitative easing (57%), interest rate increases (56%), the low yield environment (55%), regulation (43%) and currency fluctuations (41%). 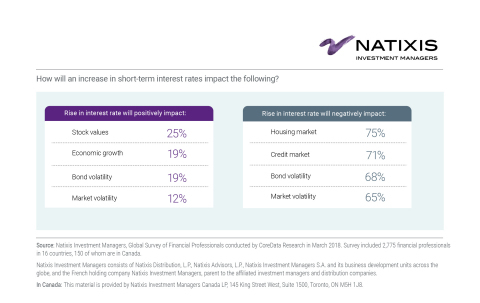 Impact of short-term rate increase: Advisors say an increase in central bank short-term interest rates is expected to adversely affect the housing market (75%), credit market (71%), bond volatility (68%), overall market volatility (65%) consumer spending (62%) and economic growth (53%). Concerns about bubbles: Advisors believe there are asset bubbles in the real estate market (49%), the tech sector (23%), the stock market (23%), and bond market (22%). They show the most concern for crypto-currencies. After those currencies experienced a considerable run up in 2017, 69% of respondents see them as a potential bubble that could burst in 2018. According to the survey, advisors are turning to active managers and deploying alternative investments to manage new and numerous risks facing their clients. Nearly nine in 10 (86%) advisors say the risks in the market add up to an environment that favors active management. These professionals demonstrate a clear preference for actively managed investments and continue to allocate the majority of assets to these strategies. 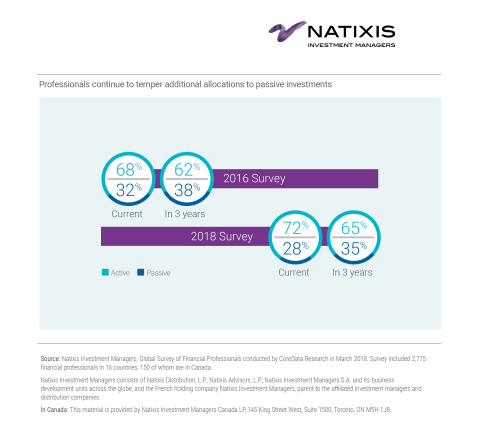 Advisors who responded to Natixis’ 20161 survey reported that 68% of the assets they manage were allocated to active strategies and 32% to passive. They projected that within three years they would moderate their active allocations to 62% and increase passive allocations to 38%. Instead, allocations to active actually have increased in the past two years. Respondents in this year’s survey now say they have 72% allocated to active management. Greater sentiment toward active management could generate a further shift to active strategies, which have become essential in recent years as advisors seek opportunities to generate alpha. Advisors say that passive strategies, in contrast, are used mainly for their lower fees (56%). Notably, 75% of advisors believe individual investors are unaware of the risks of passive investing, and the same number has a false sense of security about this type of investing. Financial advisors also believe it is important to invest in alternatives to obtain benefits such as moderating volatility, producing alpha and generating stable income. Survey results show that 66% of advisors recommend alternative investments to clients today. Their strategies include real estate/REITS (35%), infrastructure (33%), real assets (29%), commodities (19%), hedge fund strategies (17%), and private equity (15%). Nearly half (47%) give an alternative strategy more than three years to prove itself. Diversification: Advisors most commonly cite global tactical asset allocation (40%) and multi alternatives (37%) as best for diversification. Fixed-income replacement: Top choices for providing a source of stable income include option writing (34%) and real estate (17%). Volatility management: Advisors cite market-neutral (48%) and long-short equity (24%) as best suited to manage volatility risk. Enhance returns: One quarter (25%) cite global tactical asset allocation as their top choice for enhancing returns. They also see long-short equity (20%) as useful in meeting this objective. Inflation hedge: Advisors view real estate (18%) as best for inflation hedging strategies. Reduce risk: Top choices for risk mitigation include long-short equity (25%), long-short credit (21%), and market neutral (18%). Investors need to know themselves and the markets in order to make sound decisions, especially during growing volatility. 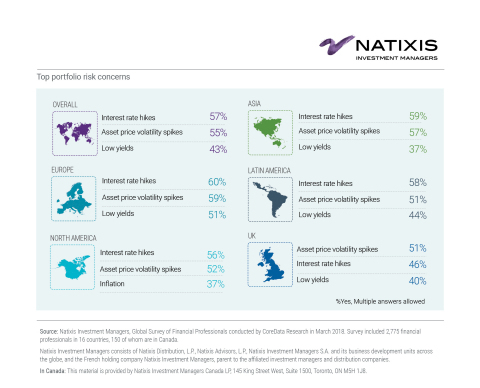 Yet, just over half (53%) of advisors in the Natixis survey believe investors understand the risks of the current market environment, and an even smaller number (43%) believe that investors are prepared for a market downturn. Eighty-one percent say the extended period of higher markets has made investors complacent about risk, and 82% say risk awareness often comes too late, with investors not recognizing risk until bad outcomes have occurred. Natixis Investment Managers 2018 Global Financial Professionals Survey was conducted by CoreData Research March 2018. Survey included 2,775 financial professionals, including wirehouse advisors, registered investment advisors and independent brokers and dealers, with $113.7 billion in assets, in 16 countries and territories in Asia, Continental Europe, Latin America, the United Kingdom and the Americas. In Canada, CoreData surveyed 150 financial professionals. 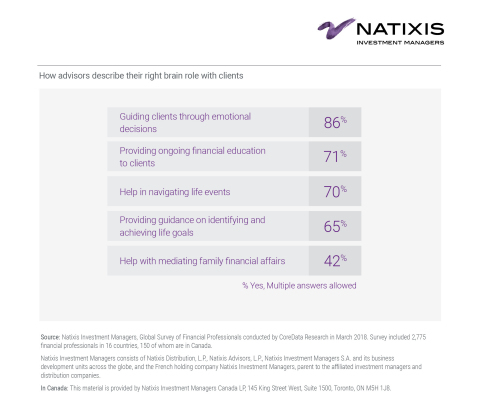 These findings are also published in a new whitepaper titled “Meeting of the Mind.” For more information, visit im.natixis.com/us/research/financial-professional-survey-2018. Natixis Investment Managers serves financial professionals with more insightful ways to construct portfolios. Powered by the expertise of 26 specialized investment managers globally, we apply Active ThinkingSM to deliver proactive solutions that help clients pursue better outcomes in all markets. Natixis ranks among the world’s largest asset management firms2 with more than $1 trillion assets under management3 (€818.1 billion AUM). Headquartered in Paris and Boston, Natixis Investment Managers is a subsidiary of Natixis. Listed on the Paris Stock Exchange, Natixis is a subsidiary of BPCE, the second-largest banking group in France. Natixis Investment Managers’ affiliated investment management firms and distribution and service groups include Active Index Advisors®;4 AEW; AlphaSimplex Group; Axeltis; Darius Capital Partners; DNCA Investments;5 Dorval Asset Management;6 Gateway Investment Advisers; H2O Asset Management;6 Harris Associates; Investors Mutual Limited; Loomis, Sayles & Company; Managed Portfolio Advisors®;4 McDonnell Investment Management; Mirova;7 Ossiam; Ostrum Asset Management; Seeyond;7 Vaughan Nelson Investment Management; Vega Investment Managers; and Natixis Private Equity Division, which includes Seventure Partners, Naxicap Partners, Alliance Entreprendre, Euro Private Equity, Caspian Private Equity;8 and Eagle Asia Partners. Not all offerings available in all jurisdictions. For additional information, please visit the company’s website at im.natixis.com | LinkedIn: linkedin.com/company/natixis-investment-managers. In Canada: This material is provided by Natixis Investment Managers Canada LP. 1 Natixis Investment Managers 2016 Global Survey of 2,550 Financial Advisors conducted by CoreData Research in July 2016. 3 Net asset value as of March 31, 2018 is $1.008 trillion. Assets under management (“AUM”), as reported, may include notional assets, assets serviced, gross assets and other types of non-regulatory AUM.